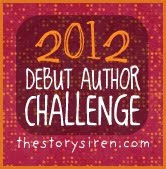 This is the fourth book reviewed in the 2012 Debut Author Challenge, hosted by the Story Siren. 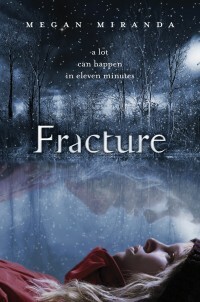 I'm not sure if Fracture was about Delaney's "paranormal" talent or a case study on dysfunctional relationships. First, there's Delaney: a girl who wakes up from a coma and experiences weird pulling sensations and discovers she can sense impending death in people. Which would have been interesting if her ability was a little more climatic and exciting. What's so unique about sensing the dying if she's only drawn to those who are already sick (or would be sick)? Even I can tell you they wouldn't live. Why not have her sense those who might die in a car crash or get murdered? ...And then save them? If it were me, I would be less concerned about her "sensations" and more about her obsessiveness over her schoolwork. She died, came back to life, and is worried about her chance at valedictorian?! (Okay, okay, maybe I can kind of understand that being a little Type A myself...but still...that's what you worry about after dying?!) Well, that and apparently her weight. Then there's her rescuer, Decker (oh look, they both begin with "D"), who she likes but can't seem to say what she means to him and begins keeping secrets from him. And still keeps secrets from him even though he drops everything and to come to her spoiler (rescue AGAIN! from the psycho killer). Decker, who is a love sick puppy who keeps sticking around, keeps asking her to clue him in (but she doesn't), and so devoted that it's making me sick. Should we talk about the mom now? The mom, who seems more worried that her child isn't fixed than the fact that she's alive. The mom, who has her own skeletons in the closet. But nothing compares to Delaney's relationship with Troy, the mysterious stranger. Troy, who has spoiler (a similar ability) and happens to know just a little too much about Delaney. Yet she's perfectly fine hanging out with him. Troy, who almost spoiler (KILLED HER--to end her "suffering" while comatose). And Troy, who turns spoiler (crazy, as in chase-you-down-in-a-car-in-a-sing-song-voice, crazy after Delaney finds out he almost murdered her). And yep, you guessed it! She's fine with looking for him afterwards and trying talk sense to him. Look-you can't talk sense to a psycho. Now I'm going to give her the benefit of the doubt and assume she's acting like this because her brain is damaged: some psycho boy tries to spoiler (kill you), bruises your arm, and you're okay with that? All in all, four case studies, but that's not even counting the one with the boy she doesn't like but still kissed. Unfortunately, I was looking for a paranormal story, not a dysfunctional one. Fracture is now available at booksellers everywhere. But maybe you'll have a different opinion: Check out the first 2 chapters below.